The spoon exhibit will be open to the public until May 12. The Charles B. Wang Center is home to multiple art exhibits, most recently a display of the art exhibition “Five Elements: Six Roots Contemplate Its Origin in the Spoon Fed World.” It is a mixed media installation by Chee Wang Ng. The focus of the exhibition is the identity of the Chinese diaspora. Through the use of colored bowls and spoons, Ng explores the connection of Chinese people to each other and to the world around them. The elements of traditional Chinese cosmology—wood, fire, earth, metal and water—are represented by multiple sets of bowls in the colors of green, red, yellow, white and black, respectively. The exhibition is set up behind a glass wall and comprises four square pillars and one table arranged in a V-formation. The table, which is the lowest in height, is the point of the V with the other four pillars behind it in increasing height order. Two artists recently visited the Charles B. Wang center to celebrate their latest art exhibitions. 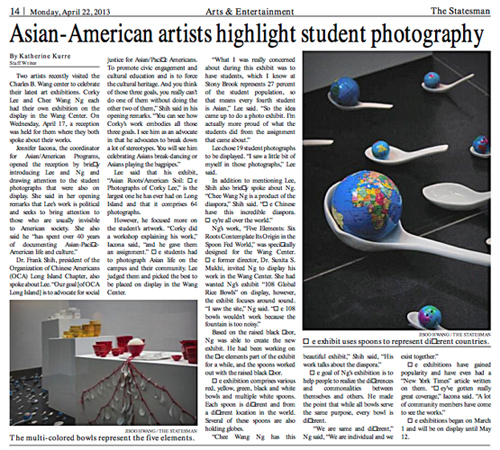 Corky Lee and Chee Wang Ng each had their own exhibition on the display in the Wang Center. On Wednesday, April 17, a reception was held for them where they both spoke about their works. Lee said that his exhibit, “Asian Roots/American Soil: The Photographs of Corky Lee,” is the largest one he has ever had on Long Island and that it comprises 64 photographs. However, he focused more on the student’s artwork. “Corky did a workshop explaining his work,” Iacona said, “and he gave them an assignment.” The students had to photograph Asian life on the campus and their community. Lee judged them and picked the best to be placed on display in the Wang Center. Lee chose 19 student photographs to be displayed. “I saw a little bit of myself in those photographs,” Lee said. Based on the raised black floor, Ng was able to create the new exhibit. He had been working on the five elements part of the exhibit for a while, and the spoons worked out with the raised black floor. The exhibition comprises various red, yellow, green, black and white bowls and multiple white spoons. Each spoon is different and from a different location in the world. Several of these spoons are also holding globes. The goal of Ng’s exhibition is to help people to realize the differences and commonalities between themselves and others. He made the point that while all bowls serve the same purpose, every bowl is different. The exhibitions began on March 1 and will be on display until May 12.